The emphasis of this introduction, however, centers on the period before and leading up to 1933, when the National Socialists under Adolf Hitler ascended to power. Syndicalism, and more specifically Anarcho-Syndicalism are movements that have been largely forgotten. This albeit superficial outline should, at its conclusion, show that this movement was not always so obscure and unknown. This piece aims not to comprehensively examine all the varied aspects of German Anarcho-syndicalism, but rather to pique the curiosity and interest of its readers. 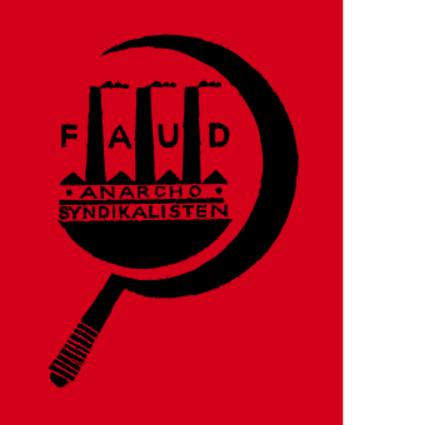 You can find the whole text also as a pdf on the website of the "Institut für Syndikalismusforschung" (Institut for (anarcho)syndicalismresearch) in Bremen. This is a pretty important english language FAUD document. In the sense of giving folks an anarcho-syndicalist perspective on the FAUD. And folks who can read German, the Bremen comrades have really been quite good in getting German a/s history up and out. Really freaking cool. I know very little about the FKAD. Somewhere along the way, I recall there was some controversy between (I believe I'm getting this right), the editor of the KFAD newspaper and Rudolph Rocker. I'll have to refresh my memory and look it up at some point. I don't recall what the issue(s) were. "Nice guy".....libel. What is it with some and the courts? I will be curious to learn more about the differences between the KFAD and the FAUD, other than personalities. Such as the programatic, organizational, tactical differences and so forth.